Kim Jong-Un here. I am pleased to report a stunning victory against the dotards this afternoon. We surely tamed the opposition with our fire breathing efforts. 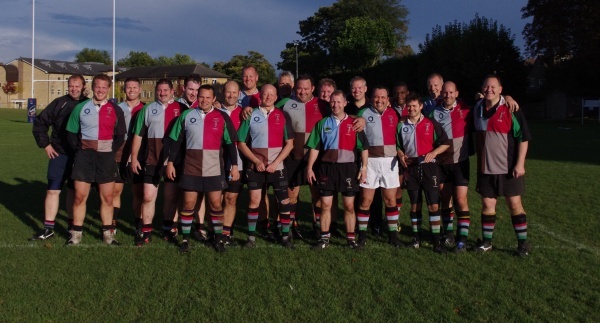 Back in the real world, a series of very unfortunate events occurred today, as Lemon Snickett would say, which resulted in the Vets losing to Sutton and Epsom 78 - 31 and a match report, being a challenging article to write. Still, what were we doing playing two teams in Sutton AND Epsom? Surely this was some mistake? We don't even have our own town to call upon for numbers. Also, PA very kindly gave me a lift this afternoon and on the way bleated on about having a bloody nose having tackled someone in training, but then also tried to join a rival rugby team prior to arriving at the ground (honestly I kid you not). Thankfully we were lucky enough to welcome back Karl and Brando fresh from their exploits from playing for Surrey - brando who played well for his customary five minutes on the pitch. However Dave No Love for the Vets decided to continue playing for the ones (we wish you the best of luck) and where's Wally (a welcome addition) was a no show until the second half having been told to jog on from the ones due to the incorrect paperwork. Also having a resident chef as our newly installed captain, i expected some cornish pasties either before or after, however no such luck. It was also good to welcome back our team manager Greeny who continues to make progress, which is great to see! Enough ramblings, the reality, which cannot be avoided is we were seriously pumped for a significant part of the game. Credit to the team overall who stuck together, didn't start sniping and scored five tries in total, two of which were scored by PA (particularly galling), with rupert, si morgan and our newest recruit boxie (? ), all in the corner as well. We looked good out wide when the opportunity arose and the forwards made solid ground when they had the ball but it is tough to ignore the large amount of tries that went the other way. The reality is the league has got a lot tougher this year, I challenge someone to find a harder vets league, with every club having substantial infrastructure and numbers, and to be competitive, fitness levels (including yours truly), needs to improve dramatically. Whilst this was not the easiest game, it probably wasn't the hardest we are going to have either.